I have dysautonomia. That means that my autonomic nervous system does not regulate properly. The autonomic nervous system controls everything in the body that you don't have to think about such as heart rate, blood pressure, circulation, temperature regulation, digestion, sensory perception, energy production, and more. Because my autonomic nervous system does not function properly, all of these processes are impaired. Basically, this leaves me very tired, weak, brain fogged, and sensitive to sights and sounds. Dysautonomia is an umbrella term used to describe a dysfunction of the autonomic nervous system. There are many different types of dysautonomia. One specific type of dysautonomia I have been diagnosed with is POTS (Postural Orthostatic Tachycardia Syndrome). People with POTS have a significantly elevated heart rate upon standing. My body fails to adjust to gravity when I stand. When a healthy person stands up the veins in his legs constrict to send the blood back up to his heart and brain, but my veins do not constrict sufficiently to accomplish this. This causes blood to pool in my legs and abdomen, which reduces normal blood flow to my brain. My heart rate increases in an effort to keep my blood circulating properly. Another illness of mine that falls under the dysautonomia category is gastroparesis, which is a paralysis of the stomach. My stomach empties too slowly after eating. Sometimes it empties so slowly that eventually I throw up instead. However, it usually does empty; it just takes a while. Because my stomach is partially paralyzed, I typically have to eat a low fat, low fiber, low dairy diet. Fat, fiber, and milk protein slow down digestion, so limiting these in my diet makes it easier for my stomach to empty properly. When my gastroparesis flares up, I have to go on a soft foods and liquid diet. Because my dysautonomia symptoms have grown worse over the years, some of my doctors don't use the diagnosis POTS with me anymore. They say that I have dysautonomia because that covers my broad range of symptoms. Some believe that I have a mitochondrial disease as a root cause for my dysautonomia. Others think I have ME/CFS in addition to dysautonomia. It's hard to know for sure, but we do know that I have dysautonomia. There is no cure for dysautonomia, but there are treatments available to help keep some symptoms under control. Every patient responds differently to the medications, so it can take some time to find the right combination of meds for an individual. If and when a dysautonomia patient finds a good combination of meds, it may improve symptoms greatly or only offer slight relief. Here are a few of my blog posts that share about dysautonomia and how it affects me on a daily basis. If you have more questions about my life with dysautonomia, you might find the answers on my FAQ page. If you would like to know more about dysautonomia, the Dysautonomia Information Network is an excellent source of information. The painting above was first introduced to me by Dr. Blair Grubb. It is titled The Doctor and His Patient and was painted by Jan Steen in the mid 1600's. This was during the Dutch Realism period when artists were starting to paint real life, and even sick people. 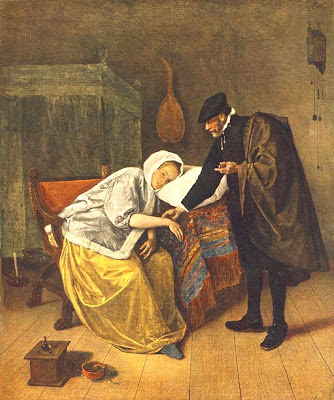 My doctor believes that Jan Steen was painting someone with Ehlers-Danlos Syndrome and POTS! If you look closely, you will see that the woman has fair skin, light hair, light eyes, and her body appears "loose", all of which is classic EDS. Notice she also appears faint and tired. The hand the doctor is using to take her pulse is her normal skin color. The hand that is in her lap is a bluish color, which happens when blood pools and doesn't circulate properly. so sad you have to deal with POTS...so happy I found your blog (as I do too). You are an encouragement! You are one of God's chosen children and I am thankful for your obedience to blog and press on for the good of Christ even when it is tough. I have a friend with a different type of autonomic dysfunction. She is going to the Mayo Clinic in hopes of stopping her seizures. She also has a service dog. She has been dealing with this disease for years. Her name is Elise. Although she is 1/2 my age, I feel she is my kindred spirit. I'm dealing with Mixed Connective Tissue Disease, Chronic Migraine, Fibro.,Asthma and a host of other illness. Your site looks lovely by the way. May you have many good days and may God bless you. Hi! I found your blog through the invisible illness week website, and am so glad I did! I, too, have Dysautonomia and can relate to a lot of what you have written. I look forward to reading more! I found your blog somehow through your post on gratitude. I ended up reading that, ordering the book and forwarding your post to my kiddos (DINKs). What a blessing to all of us! Thank you. I just read your story about your battle with POTS. I cannot imagine what you go through, but, wanted to share with you that you're not alone. Although I suffer from many severe chronic auto immune diseases, some of my symptoms of those diseases match yours. So, I just want to say that I can appreciate what you go through day after day after day and I am so sorry. You exhibit great strength in my eyes and I am proud that you are pushing forward. You're a blessing with an amazing story to tell.